The Poem Farm: Eraser Dust, Poetry Art, and Chalking! Eraser Dust, Poetry Art, and Chalking! 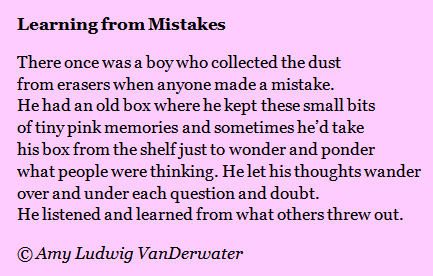 Students - Today's poem comes from a childhood memory of a young second grade friend who used to collect eraser dust. I've written David's pencil shaving collection before, yet this idea of collecting small bits of others' trash is still fascinating to me. 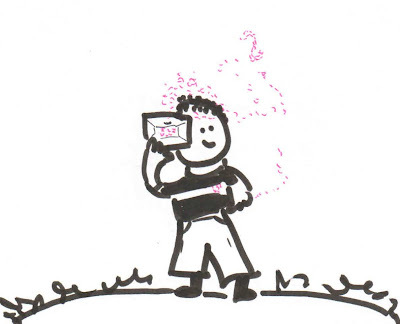 Just imagine if eraser dust could talk...what we would learn! Today I am tickled to welcome teacher Jennifer Beach and her third grade students from Glenwood Elementary School in West Plains, Missouri. Earlier this week, Jennifer sent me an e-mail with photographs of her students' beautiful poetry art. I asked her if she would be willing to share her class's process for their foil art, and lucky for us....she was willing! I turn you over into the artistic and thoughtful hands of Jennifer Beach. Please click to enlarge any of these wonderful images. 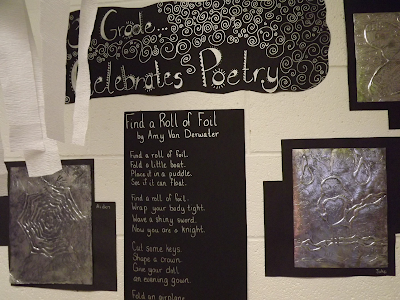 While looking for ideas for National Poetry Month this last April I came across Find a Roll of Foil and knew I had to use it in my class in some way. Long story short, my class and I read this poem and talked about it. We studied all the normal things that you do with poems and then we decided to find a roll of foil for ourselves! What wonderful imaginations the kids have. 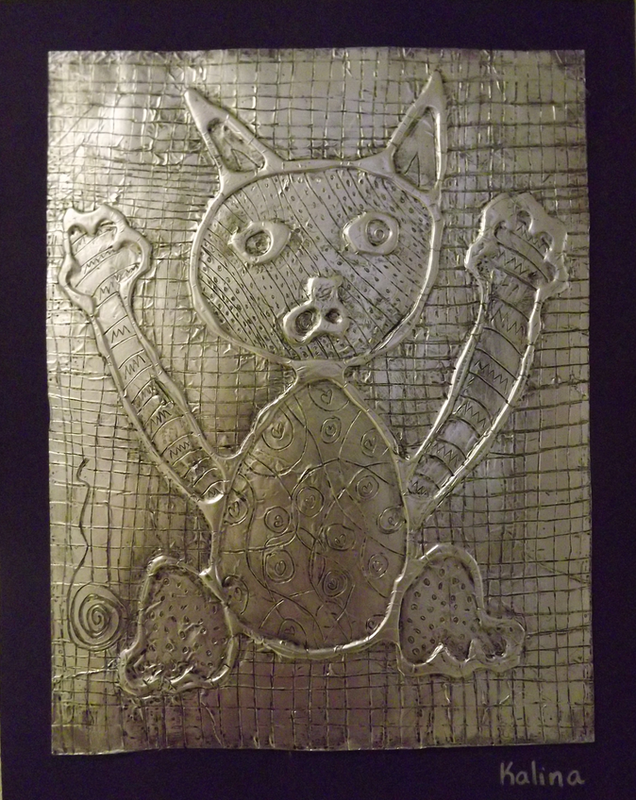 Our art teachers at Glenwood have made a similar project with their students before and helped me to figure what glue to use and I also found this art teacher's blog when I searched for foil scratch art that was really helpful. We have many times made line drawings and decorated them with markers so this was a natural progression from that. We brainstormed with partners all of the things you could make from foil, and we made two lists: things we've made from foil and things we'd like to make from foil. (After the project we also made a list of recycled items that could be used to make art like bottle caps, paper tubes, tin cans, etc., and I challenged them to create something new over the summer using some of these items to share with me in August!) 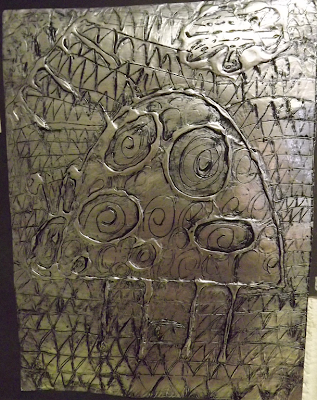 We decided instead of making a foil sculpture we wanted to make pictures to hang on the wall. The kids used their ideas to help them draw pictures. We looked at Mexican folk art and abstract art to get ideas for Kalina's cat, and as you can see, she took the ideas and ran with them. It was a great learning experience for all the kids since we did a lot of this kind of research for all their ideas. 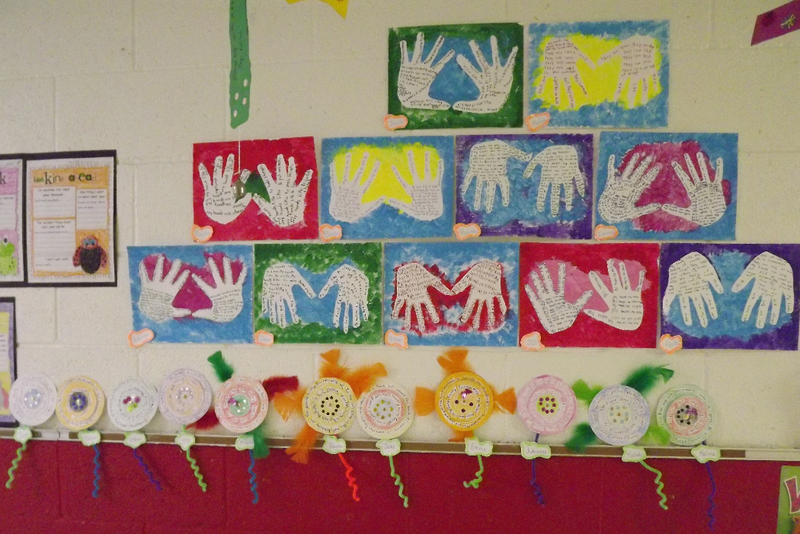 The pictures were drawn by the third graders onto a piece of plain paper in order to plan their artwork. I asked them to stick with a simple outline that had one large main figure in the middle. We then drew the outlines onto pieces of tag board. We used Elmer's Glue All to trace the outline and all major lines and set it aside to dry overnight. The next day we covered each entire piece of tag board with Elmer's Glue stick (the purple kind that dries clear is really the best because they could see where they had already spread glue) and placed a piece of foil on the top. We used cotton balls to press and smooth the foil down and then Q-tips to fine press around the glue lines. Once that was done, we used the handle end of a paint brush or a dull pencil to etch the designs in the figures. Many of the kids wanted to see examples of different line designs so we looked up artwork by famous artists that incorporated lines into their art. After they finished their lines, we covered the entire pieces in black liquid shoe polish, let them dry for a few seconds, then rubbed them off with paper towels. The other third grade class used the solid shoe polish and instead of wiping it off just left it on. Theirs turned out a darker almost blue look, like old silver. Emilie's ladybug from that class is an example, and they were just as pretty. Both classes had just exceptional work. The kids were so excited and just loved it, but it was a time consuming project. 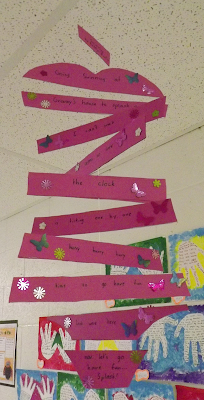 I was really impressed that my 9-year-olds finished such fine pieces of artwork, and we had a lot of fun reading the poem and looking at The Poem Farm. They have been so excited with our poetry month. 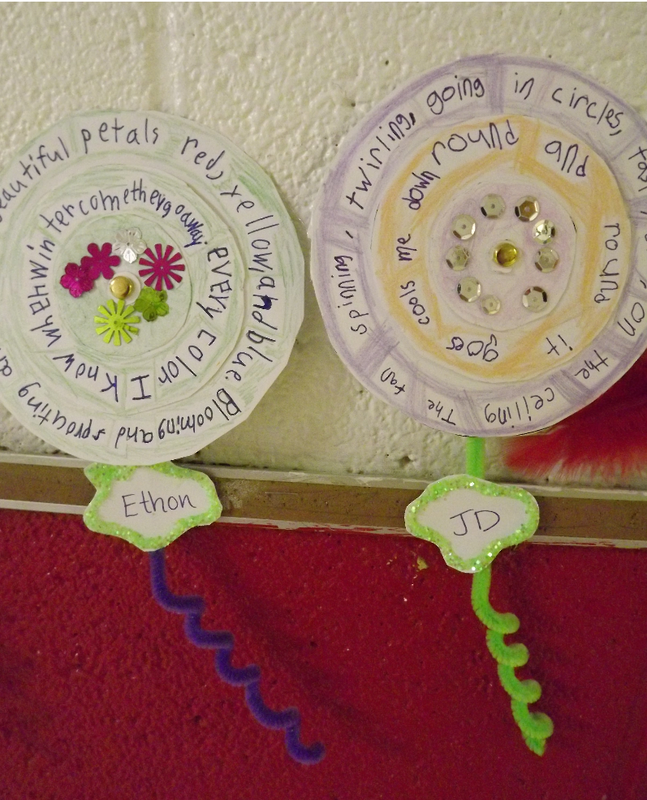 We also made: poetry paper bag kites, spinner poems, hand print poems, and poetry mobiles. We had a blast, and I enjoyed seeing the kids so engaged. The last week of school we made summer journals to take home with them and they all signed each other's journals and wrote messages to each other. What a very fortunate class to have made these works or art and these memories together. Thank you, Jennifer and students, for sharing with us here today. I am truly grateful. Wonderful post, Amy, every bit. I love the foil art done by Jennifer Beach's third graders. 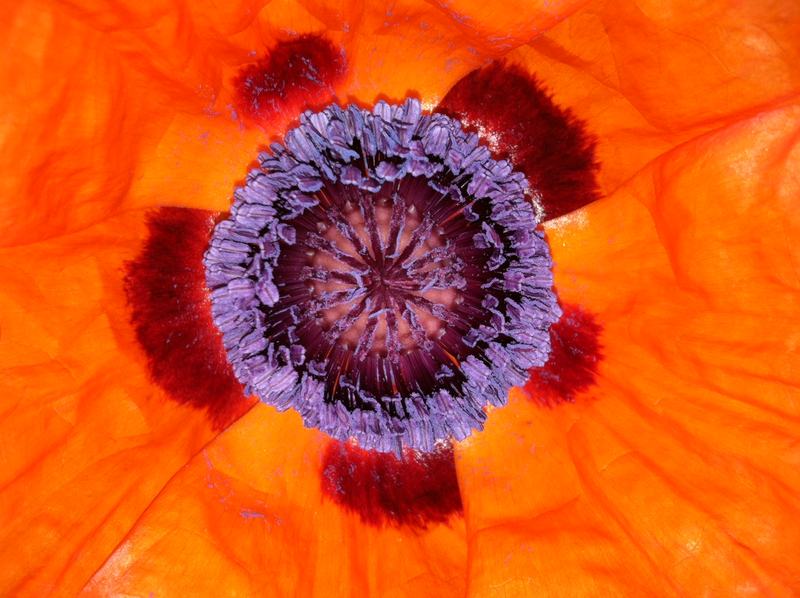 Beautifully done, plus all their poetry from April is a joy to see. Your front stoop looks great too. Feels as if we're back in April! Wow! I'm so impressed with the creativity of Jennifer and her students! I love how they used your poem (which is fabulous, by the way) as a springboard for such amazing work. And an Issa poem on your rock... be still my heart. Thanks for sharing all this goodness today. Robyn has it right - this is a happiness-making post. All the artwork is so joyful! Love your poem,too - especially that last line. Love these! Eraser dust, tin foil, handprints...inspiration is, indeed, all around us. Great post to create some smiles! Wow, just wow. There are so many amazing creative people in this world. I'm in awe! I am doing an art camp for kids this summer and have marked this post for its awesomeness. 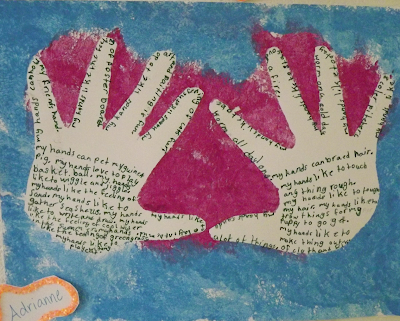 Such a fun project and a great example of using literature with art. Thanks! Love the eraser dust poem and all the wonderful art work. Such a joyous celebration of poetry! There are so many different ideas here to share with my second grade colleagues! This is wonderful work. Wow!What a wonderful post. I love that eraser dust poem. And you made magic with that foil! Where do I even begin with my comment? The eraser dust poem, adorable. You must be bubbling over with excitement with the foil art and poetry awesomeness. 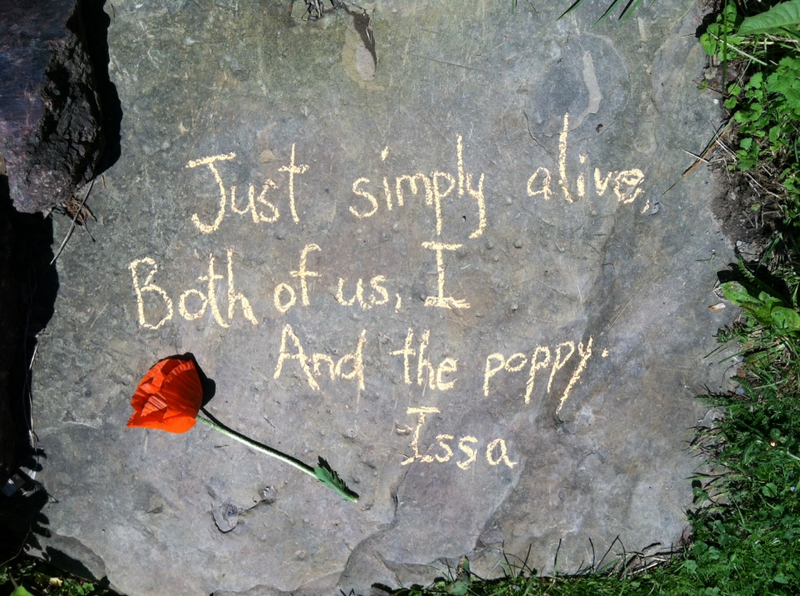 The chalk poem is so delicate and sweet. I would love to come upon that stone someday. Thank you for all these celebrations of poetry. 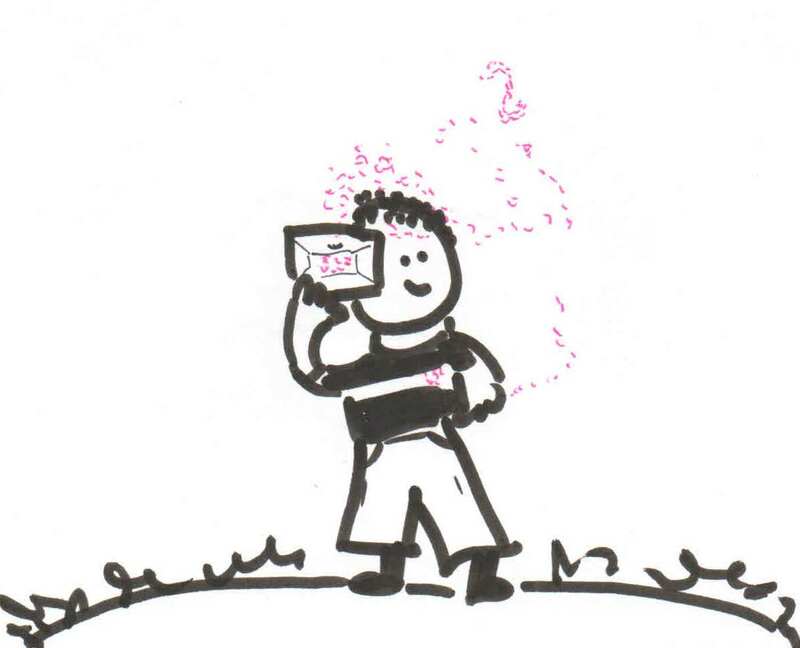 I love the idea of listening to the eraser dust. And the tine foil art is gorgeous. I think I'll sneak outside and leave some haiku on the sidewalk around the neighborhood.